What blooms when? The bloom times of some plants are predictable, while others vary year to year based on winter conditions and early spring temperatures. It’s no secret we’ve had a lot of late sleepers this spring. Maybe the plants, like many people, are just confused by changing and fluctuating weather patterns in general. As a native of Seattle, I can’t remember a May as cold as this year’s. However, bulbs bloomed like clockwork and the cool weather preserved the blooms for longer than normal. In fact, I’ve never seen the bounty of tulip blooms I have the last couple of months. On the other hand, most rhododendrons have been late to flower. Take heart. Most plants will have “caught up” by June, a month that never disappoints, whatever the weather conditions. 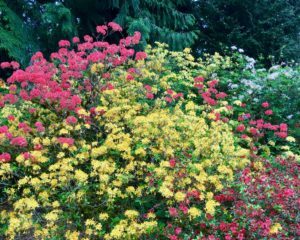 During June expect the late rhododendrons and azaleas to make a show along with many varieties of iris, budding allium, and other ornamental onions. Perennials will begin to flower when the temperatures warm up this month (some are in full bloom now). And flowering trees, which began in January with witch hazel, include late varieties that are still blooming in June. When designing a garden, you want to think about bloom sequence. June, with so much going on in the garden, is a good time to examine which of your blooming plants compliment one another. 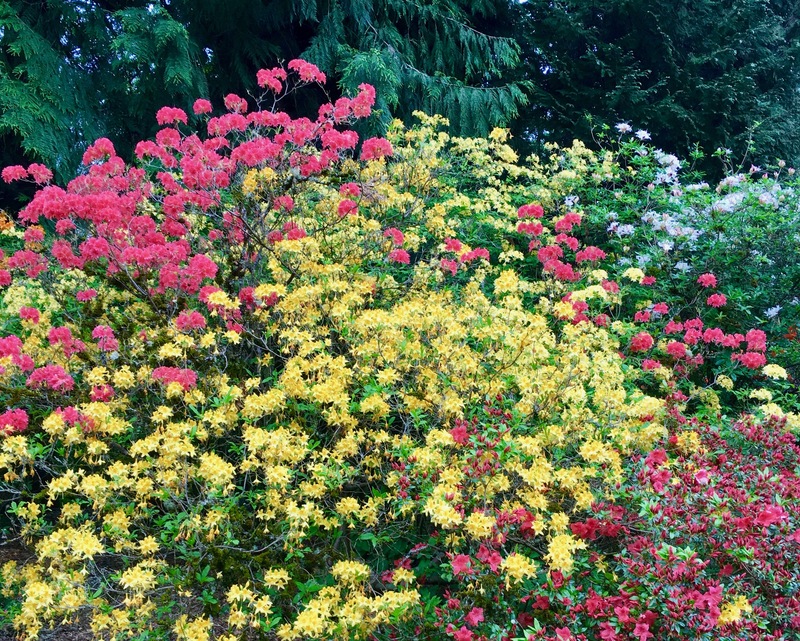 When you evaluate your garden, pay attention to color combinations. Contrast size and textures of adjacent blooming plants. In nature almost all colors can look good side by side, but like paint, the right shades and combination can make a dramatic statement. See color combinations you love or hate? Remember that most plants can be moved (or replaced) if next year you’d prefer to see a different palette. When you are examining your garden blooms, don’t forget to take into account the color and textures of foliage. You can fill in with annuals, too. Early June is a great time to plant annuals. As soon as there is enough sun to provide warmth, they’ll grow fast and full. June here is Seattle is typically still cool and wet enough for planting. You’ll find that nurseries have their best selection of plants right now. So don’t procrastinate, plant a garden today! For help with all types of garden planning, landscape design and successful plants for your garden, contact us. This entry was posted in Blog and tagged allium, Azaleas, flowering trees, garden planning, landscape design, ornamental onions, Rhododendrons, successful plants, Witch Hazel. Bookmark the permalink.